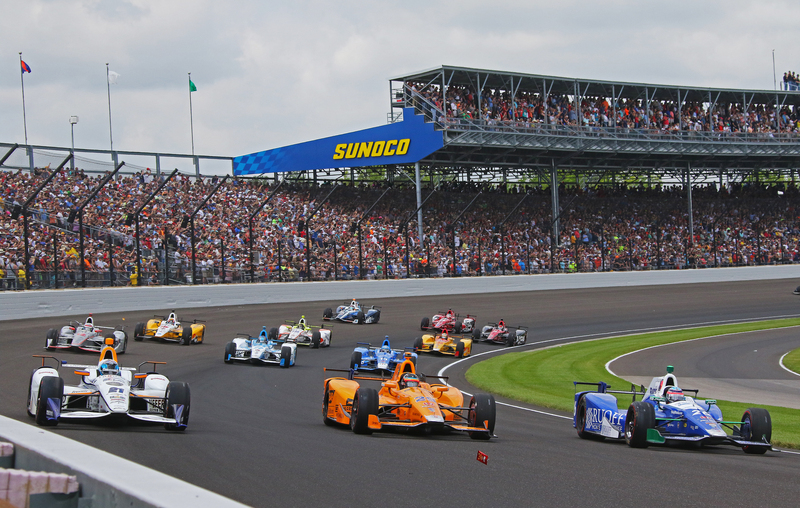 INDIANAPOLIS – The 101st Indianapolis 500 is under way at the famed Indianapolis Motor Speedway. We will be providing live updates throughout the afternoon of today’s event, which is currently under red-flag conditions on Lap 56. View full 2017 Indy 500 results below. Chip Ganassi Racing driver Scott Dixon (No. 9 Camping World Honda) led the field to the green flag, having scored his third career Indy 500 pole on May 21. After starting from the inside of Row 3, teammate Tony Kanaan (No. 10 NTT Data Honda) took and then traded the lead with the Kiwi over the course of the opening laps. It marked Kanaan’s 13th time leading the Indianapolis 500, tying him with A.J. Foyt for most all-time. After leading four laps, Kanaan notched his 4,000th career Indy car lap led. Ed Carpenter (No. 20 Fuzzy’s Vodka Ed Carpenter Racing Chevrolet) took the lead when Kanaan made his first pit stop on Lap 28. After starting fifth in his maiden Indy car race, Formula One double world champion Fernando Alonso only needed 37 laps to take the lead in the No. 29 McLaren-Honda-Andretti Honda. The first caution of the day came out on Lap 52 when Dixon and Jay Howard (No. 77 Lucas Oil/Team One Cure Schmidt Peterson Motorsports Honda) made contact in the short chute between Turns 1 and 2. Dixon’s car was launched into the SAFER Barrier lining the infield between the turns, causing significant damage to the catch fencing. Both drivers got out of their cars under their own power and were later cleared and released from the IU Health Emergency Medical Center at the track. Repairs to the fencing necessitated the red flag being displayed at the completion of Lap 55. After an 18 minute pause for the repairs, engines refired, and when the race resumed on Lap 60, four of the six Andretti Autosport-owned entries battled for the lead, with Alonso, defending race winner Alexander Rossi (No. 98 NAPA Honda), Ryan Hunter-Reay (No. 28 DHL Honda), and Takuma Sato (No. 26 Honda) trading the point. On Lap 66, AJ Foyt Racing’s Conor Daly (No. 4 ABC Supply Chevrolet) made contact with the Turn 3 SAFER Barrier, bringing out the second caution of the day. Michael Shank Racing with Andretti Autosport driver Jack Harvey (No. 50 Honda) spun to avoid debris left by Daly’s incident, and made contact with the with the inside wall in the north short chute. Both drivers emerged from their vehicles without assistance, and shortly thereafter were checked and released from the IU Health Emergency Medical Center and cleared to drive. At the time of the incident, Sato was in the lead, as the Japanese driver led his second Indianapolis 500 in eight attempts. Racing resumed on Lap 75, but went back to yellow for debris on Lap 81. The pits opened during the caution, where most of the leaders came to pit lane, while Team Penske’s Will Power (No. 12 Verizon Chevrolet), Max Chilton (No. 8 Gallagher Chip Ganassi Racing Honda) and Helio Castroneves (No. 3 Shell Fuel Rewards Team Penske Chevrolet) stayed out and led the field to the Lap 84 restart. Chilton passed Power off the restart to lead his first laps at the Indianapolis 500, and just his second time leading an Indy car race, but Hunter-Reay and Rossi quickly returned to the fray, passing Chilton and trading the lead. Castroneves worked his way to the front just before the halfway point, and the three-time “500” winner led The Greatest Spectacle in Racing for the 12th time in his career. The third round of stops saw Hunter-Reay re-assume the lead on Lap 115. Previous Indianapolis 500 winner Buddy Lazier (No. 44 Lazier Racing-Stalk It-Tivoli Lodge Chevrolet) brought out the fourth caution of the day when he made contact with the Turn 2 SAFER Barrier. Lazier has been transported to IU Health Methodist Hospital complaining of chest discomfort. Under the yellow, the No. 24 Mecum Auctions Chevrolet of Sage Karam (Dreyer & Reinbold Racing) came to a stop at the exit of Turn 1. Team owner Dennis Reinbold reported that the car suffered an issue with the battery, which stuck the car in gear ended Karam’s day. The field restarted on Lap 129, but a debris caution a lap later slowed the field again, for the fifth time on the afternoon. The Lap 133 restart was also short lived, as one of the main contenders suffered an issue on Lap 137 when Hunter-Reay’s car lost power and coasted to a stop in Turn 3, bringing out the caution yet again. With the pits opening on Lap 139, the leaders pitted for the penultimate time, and Chilton assumed the lead followed by Charlie Kimball (No. 83 Tresiba Chip Ganassi Racing Honda), JR Hildebrand (No. 21 Preferred Freezer Services Ed Carpenter Racing Chevrolet), James Davision (No. 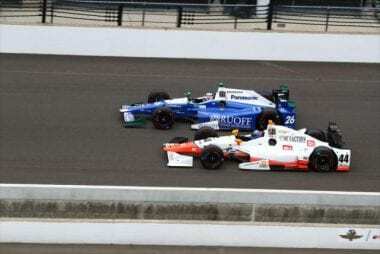 18 GEICO Dale Coyne Racing Honda), and Graham Rahal (No. 15 Steak ‘n Shake Rahal Letterman Lanigan Racing Honda). The field restarted on Lap 142, but less than half a lap was completed before Ed Carpenter and Mikhail Aleshin (No. 7 SMP Racing Schmidt Peterson Motorsports Honda) made contact in Turn 1. Both drivers continued on, but Carpenter lost part of his front wing, bringing out a debris caution, the eighth caution of the day. The race restarted on Lap 147 with Kimball in the race lead. Chilton and rookie Ed Jones (No. 19 Boy Scouts of America Dale Coyne Racing Honda) pitted on Laps, surrendering the lead to Davison, who completing his run from last-to-first with 35 laps to go. Davison was the 15th different leader of the day, setting a record for number of leaders in an Indianapolis 500. The following lap, Kimball suffered a mechanical issue and peeled off course, bringing out a ninth caution of the day. At the same time, AJ Foyt Racing rookie Zach Veach (No. 40 IWiT Chevrolet) pulled off course with an issue as well. The pits opened on Lap 168, where Castroneves beat Davison, Sato, and Hildebrand off pit lane. Chilton and Jones stayed out and assumed the first two positions, with Castroneves behind when the field restarted on Lap 171. For the tenth time of the day, the caution flag flew for smoke from the No. 29 of Alonso, whose thrilling run in his maiden Indy car race came to a disappointing end. Chilton led the field to the restart on Lap 183, but a multi-car melee in Turn 1 brought the caution immediately back out as the race neared its closing stages. Drivers involved included Power, Davison, Oriol Servia (No. 16 Manitowoc Rahal Letterman Lanigan Racing Honda), Josef Newgarden (No. 2 hum by Verizon Team Penske Chevrolet) and James Hinchcliffe (No. 5 Arrow Schmidt Peterson Motorsports Honda). Helio Castroneves stole the led from Max Chilton. Now, Sato in the lead. It’s back and fourth all day at the front of the field. 4 laps to go. The front 3 check out on the rest of the field. Helio is looking to make a run. Ed Jones slips passed Chilton. Jones could steal the win if there’s trouble at the front. Helio Castroneves goes high. That didn’t work, or maybe it was a test, he pulls back. 5 car lengths to the leader. White flag. 2.5 miles to go. Sato looks like he’s heading to a win at Indianapolis Motor Speedway. Takuma Sato wins the 2017 Indy 500!